I love Thai food (and anything Southeast-Asian) and that is a fact. It all started when I fell in love with authentic Tom Yam soup and Mango Fish served home-style in a restaurant managed and operated by our company’s Thai staff back in Brunei. Its distinct taste is just something we crave that we regularly frequent a small but cozy Thai restaurant in Yong An Li. Though there are few recipes I bookmarked for quite sometime now but have yet to recreate, particularly from Eet Smakelijk!, this is the first time I had the time (and the heart) to try. 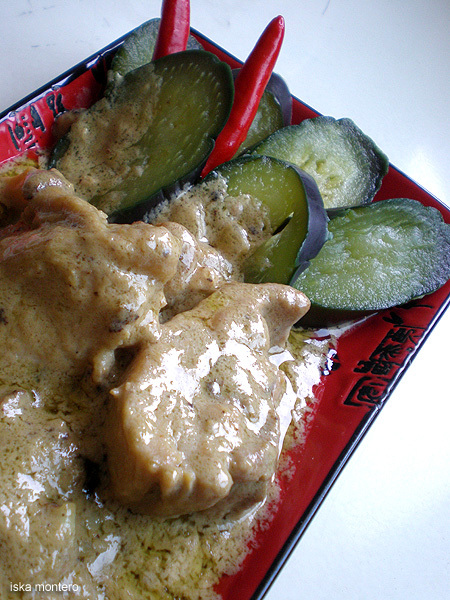 I happened to find a packet of Thai Green Curry Paste a week ago with a recipe attached that is surprisingly easy. Of course, I didn’t follow it exactly as written; made a few alterations on the how-to and voila! My first time to cook Thai! I’d say the result’s a success what with the added Thai spice in our lives for lunch. Heat oil in a non-stick pan. Fry garlic and galangal until aromatic. Add the chicken and sear to render fat and natural juice then saute with nam pla and shallots. Stir in the spice paste and stir-fry until the meat until is nicely coated. Add half of the coconut milk and cook until natural oil appears. Pour in the remaining coconut milk and bring to a boil. 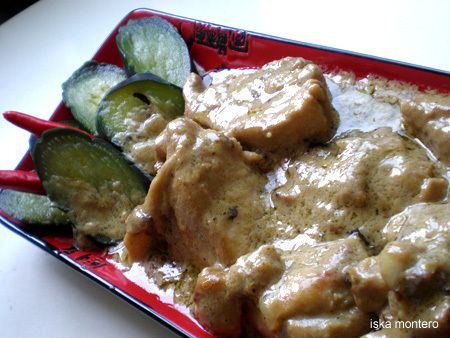 Cook until the chicken is done and the liquid is creamy. Garnish with sweet basil leaves, chili or coriander. 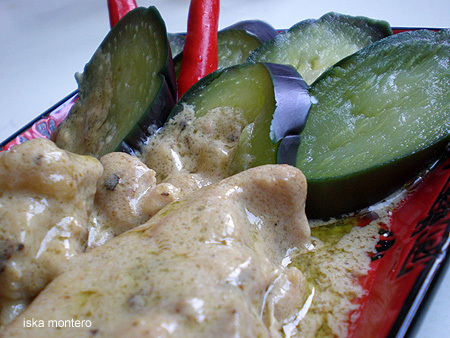 Serve hot with blanched aubergine slices and Thai jasmine rice. I love thai food too! I recently made thai green curry also using a recipe from a cookbook I bought in Bangkok. It was so good, but didn’t look half as yummy as yours does! oist! looks really yummy! pa-kopya ha! thai food is also one of my favourite asian cuisine and have been planning to do this one for quite some time . . .
Hi Christine! I just bought a packet of another Thai dish paste for a chicken dish. I will try it tonight and see how it goes. Hello Sha! Long time no hear! I miss you so much! Hi Thess! Ikaw talaga inspiration ko sa pagluto nito. Your posted recipes make me think there are easy-to-prep Thai recipes after all. Mang Mike, by all means, kopyahin mo hehehehe… Thanks to that special Thai paste!